Ah, holidays. For many, it’s the best time of the year, where you get to relax and forget your troubles. In UTOPIA 9, Whalegun’s first foray into indie gaming, the situation is quite a bit different. Utopia 9 is not only the name of the game but also the planet where it takes place. As the game informs us, Utopia 9 is supposed to be the best resort in the galaxy, as the planet has been terraformed to suit every tourist’s needs. Once we get to Utopia however, nothing is as promised. The planet is teeming with mutants and monsters which we must fight, if we are to escape the planet. Utopia 9 is a roguelike, meaning it comes with all the standard things we have come to expect from such a game. Namely, the game levels are randomly generated, while you have no extra lives. Once you die, you are dead and have to start over. If you have played roguelikes before, you will easily get how the game plays. So, instead of talking about that, let’s see what sets is apart from similar games like the Binding of Isaac and Nuclear Throne. What makes the game really stand out is the way it looks. Many roguelikes (The Binding of Isaac being a prime example) follow a rather uniform look throughout the game, with the enemies matching the colour of the terrain, and the terrain itself being associated with different levels. Instead of that, Utopia 9 has a more psychedelic look, using every colour in the palette simultaneously, from purple to red to yellow. This leads to some very pretty environments. Another thing that Utopia 9 does differently is how it approaches levels. Most recent roguelikes have elected to split a level into a number of rooms, each having its own enemies. Utopia 9 chooses to have the whole level as a continuous mass, a la Nuclear Throne. From a design standpoint, this makes a lot of sense. The game doesn’t have the myriads of different enemies that most games of its genre do, so it has to use what is uses effectively. While the decision to give enemies access to every weapon in the game does help in that regard, the aforementioned level design does more, in my opinion. Enemies have a variety of responses to your appearance. Some will attack head on, others will try to flank you, and some will run to get friends. All of these interactions make for fun gameplay and would not work in a closed off space. I also really enjoyed the game’s character progression. Throughout the game, you will get mutations, which will change elements about your character. For example, one of them will improve your carrying capacity for loot. Mutations also serve to discourage you from using the fact that there are no rooms on the levels. While you could just run from the level’s entrance to the exit without fighting anybody, the mutations that you’ll get will be fewer and hence weaker. By dodging fights, you’ll be even weaker for the next ones. Finally, a great addition to the game is the nemesis system. As you traverse the game’s levels (which have the great detail of telling you what you’ll find in them when you choose them), there’s a big chance you’ll die. In most games, dying is just that. You die, you get some statistics, and you go again. In Utopia 9, the enemy that kills you loots your corpse and assumes a name. In the following runs, should you happen upon that enemy again, you can kill him and get your stuff back. This might seem like a small detail to many, but in a game with pretty much no lore or story, these details are what provides the player with the ability to make his own story and make his characters unique. 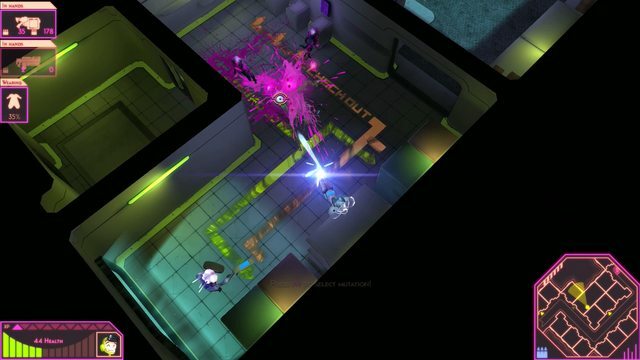 All in all, Utopia 9 is a fantastic addition to the roguelike genre. While its core is fairly standard, there are many small things that change the game enough to make it very attractive to roguelike players and newbies to the genre alike. The only issues I had with the game were in the optimization department, but considering this is Whalegun’s first game, I’d say it was a job very well done. 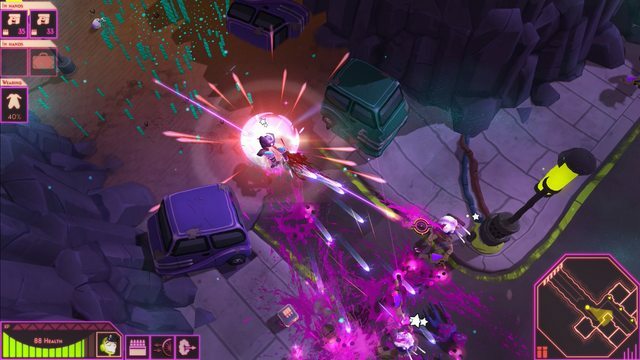 You can get Utopia 9 – A Volatile Vacation from Steam for 12 euro. Utopia 9 – A Volatile Vacation takes the age old roguelike formula and adds its own ideas, making a game with familiar gameplay but also many new elements that are enough to keep you playing for many hours. – Minor optimization and technical issues.